This is another book I read in Spain back in July (god that seems so long ago, sigh) but never got round to reviewing on here! 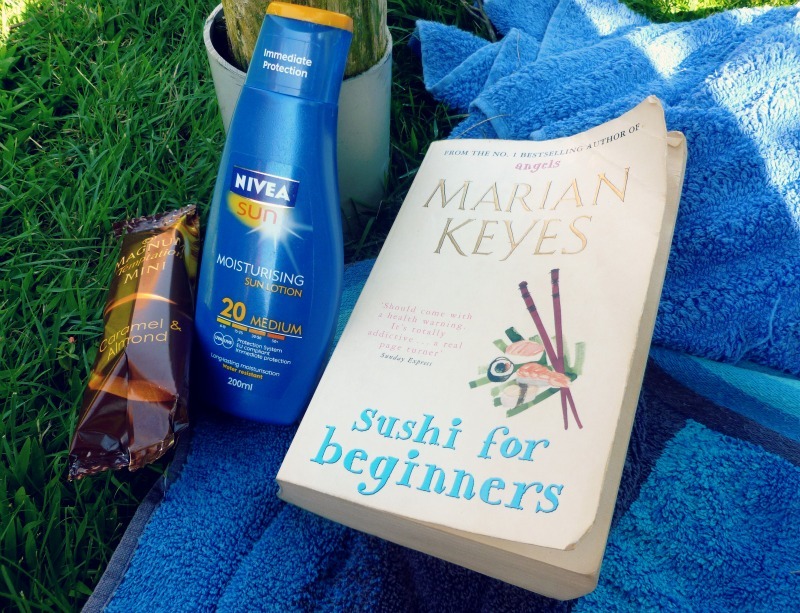 I love Marian Keyes - apart from one recently I just could not get into (Lucy Sullivan is Getting Married - anyone else found the same?) - and cannot wait to get my hands on her latest offering. I'd been keeping my eye out for Sushi for Beginners in charity shops for ages but to no avail, until just a couple of weeks before my holiday when I found about 5 copies in my local village fete book stand! Anyway, what is this about? Sushi for beginners centres around three main characters with very different problems, and how their lives intertwine. Lisa is a hot-shot magazine editor who moves to Dublin to launch new 'Colleen' magazine; bitter that she has been demoted from her swanky job in London. She meets Ashling - her assistant - who has massive confidence issues and constantly compares herself to her gorgeous best friend Clodagh. Ashling embarks on a relationship with a stand up comic, while Clodagh has a breakdown about being in, what seems, the 'perfect marriage'. This story is full of twists and turns, happy and sad moments, laughs and tears - up there with my favourite Keyes books (Rachel's Holiday and This Charming Man). I love how Keyes makes you feel like you really know the characters, like they were your own friends... or enemies! I think my favourite character was Ashling - partly because she is a fellow waist-less wonder. And typical of Keyes stories, I even started to like Lisa towards the end! These books never fail to make me laugh out loud, and Sushi for Beginners did not disappoint. Have you read Sushi for Beginners? Did you enjoy it? Which was your favourite character? Remember to enter my 500 follower giveaway here! This has got to be one of my favourite sweet treats... and my family's, friend's and boyfriend's. It is so easy to make and too easy to eat (the whole thing, in one go, oops). I call it fridge cake as there is no baking involved, simply leave it to set in the fridge, but I suppose it's not really a cake! It is sometimes called tiffin, and if you're feeling extra naughty, you can also add a layer of melted chocolate over the top. Note: this recipe is best made with plain chocolate; trust me, it wont taste bitter at all! Plain chocolate is not the same as dark chocolate however, so if you can't find plain then use milk chocolate. Or, if you are a fan of dark chocolate, I'm sure this would be lovely! I've used milk chocolate on this occasion as I couldn't find plain, which is why it is quite light in colour. I much prefer to use plain chocolate as not only does it taste nicer, but looks a nicer shade of brown! Start off by melting the butter and chocolate in a pan on a low heat. Keep an eye on it, and don't put it on too high a heat or it will burn. While this is doing its thing, crush your digestives. A good way to do this is in a large sandwich bag; do it up loosely with room to breathe, and hit on the outside gently with a rolling pin. Alternatively, break up digestives in a bowl with a rolling pin. In both cases, it's best doing it in stages so you can get the right sized pieces. You want the majority to be completely crushed and almost breadcrumb-like, but with about a quarter in larger pieces (as above). This give it a bit of bite! 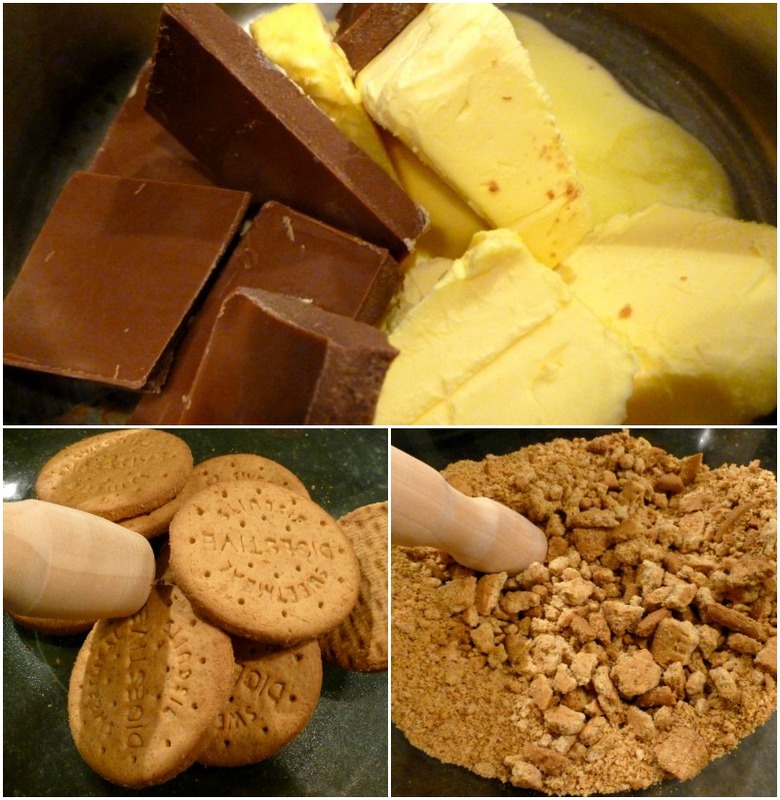 If you like your fridge cake even more crunchy, then you can use about 10 oz of digestives. 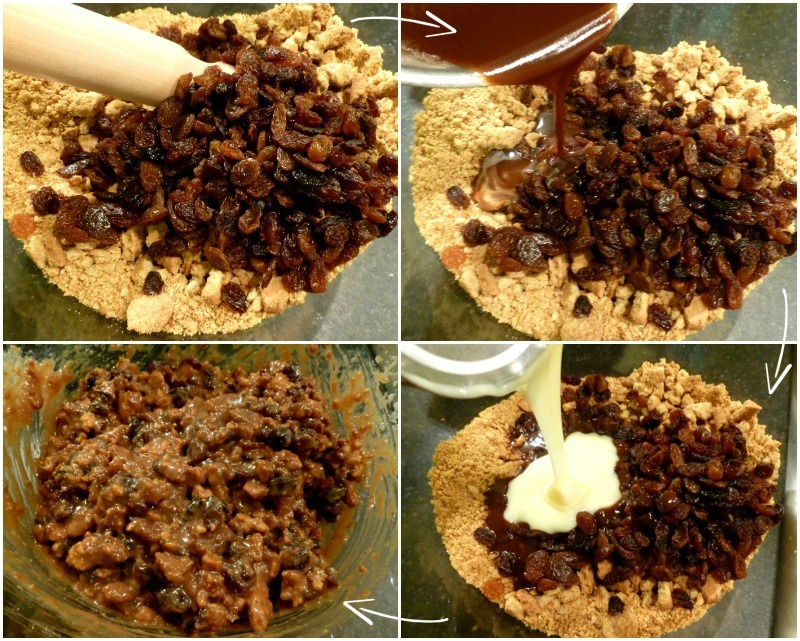 Add the raisins to the crushed biscuits, and then the melted chocolate and condensed milk. Mix together! Lay some greaseproof paper in a shallow dish, and then spoon the mixture in. No need to grease or oil! Flatten down with the back of a spoon and make sure it fills all the corners of the dish. This was for my birthday celebrations, so added some sprinkles over the top! You could also add marshmallows, glacé cherries or whatever floats your boat either on top or into the mixture. To finish, leave to set in the fridge overnight. If you can last that long! Once set, cut into squares of varying sizes (for varying appetites or levels of greed) and enjoy! Watch out, these wont last long! For me, carbonara is one of those tasty but naughty recipes that I never really get round to making. For starters, I never have cream in the fridge, and rarely parmesan. But after making my chicken leek and bacon pie earlier in the week, I had some cream left over - the perfect opportunity to whip up this recipe! To start, chop up the bacon, garlic and onion... I cheat and use frozen chopped onion - it saves so much time and effort! I also use garlic puree instead of the real deal, again its a pretty good cheat. I use a small squirt as its pretty strong! In terms of how much bacon (or pancetta if you like), I use about 4 or 5 rashers, but feel free to use as much as you like! Cook until nice and crispy! 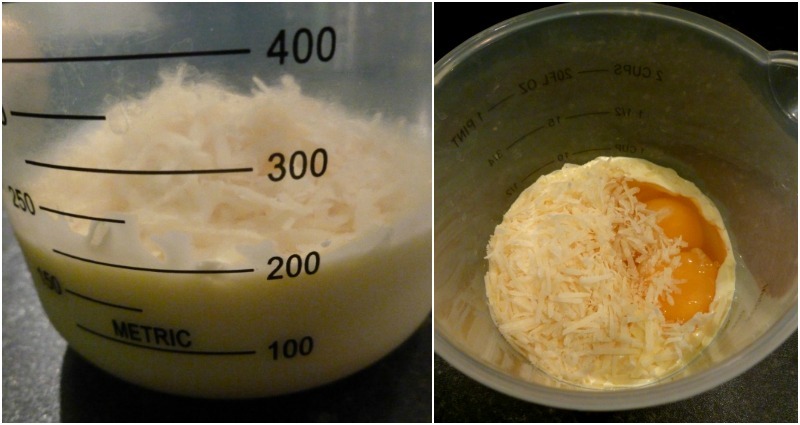 While the onion and bacon is cooking, mix together the cream, eggs and 25g (or so) parmesan. I use one whole egg, and then just one yolk - ditch the whites of one egg. Mix together in a jug and season with black pepper. Pop your spaghetti on to cook! Once the bacon and onion mixture is cooked, take off the heat add to your cream mixture. Drain the spaghetti, and stir through the cream and bacon mixture (everything in together). There is no need to cook the spaghetti with the sauce - the heat of the cooked bacon and spaghetti and the heat of the pan will 'cook' the sauce enough. If you cook it, it will turn to a dry scrambled egg type affair! Dish up into bowls and top with more parmesan. Serve with garlic bread!